Journalist Natasha Mozgovaya co-anchors Current Time in Washington, D.C., in 2015. It's produced by Radio Free Europe in cooperation with Voice of America, a government-funded news arm. President Trump, who has frequently railed against the U.S. news media and reporters, tweeted last week there should be, as he put it, a "Worldwide Network to show the World the way we really are, GREAT!" It turns out there is such a worldwide network run by the U.S. It's Voice of America. President Franklin Roosevelt created the VOA during World War II to broadcast behind enemy lines what its current director, Amanda Bennett, said was "truthful news about the war, in contrast with Nazi propaganda." She said that, over the years, the mission hasn't really changed that much. "Our job is to do two things," she said. "One is to tell America's story objectively to places that can't see it otherwise, and the other one is to bring objective news and information to places that have no other access to it. So we say that in a large part of the world we are the free press." Not only that, she said, the VOA represents the possibility that a free press can exist. That means telling the truth about America, warts and all. "We're trying to cover all aspects of it, so that people can get an understanding of the country as it really is," Bennett said. "And that means good stories, bad stories, hard issues, you know, fun issues. We're trying to give a complete picture so that people can see who we really are." For instance, the top story on the VOA's website last week was about GM's decision to close several of its factories. Former VOA Director David Ensor — an ex-NPR, ABC and CNN correspondent who now is director of the Project for Media and National Security at George Washington University — said he noticed that audience numbers jumped when VOA told some "not-so-pleasant truths" about the U.S., whether it was the protests in Ferguson, Mo., or the Abu Ghraib scandal. "When foreigners hear an American broadcaster, who's funded by the United States, talking honestly about our problems as a country, it impresses them," Ensor said. "It builds credibility for Voice of America, and that builds audience and impact, which is what Voice of America is there for." That might not exactly be what Trump has in mind, but some 275 million people around the world listen to the VOA in 47 different languages. That's important, Ensor said, and that distinguishes it from other networks, like CNN International. "What Voice of America does is it broadcasts in Hausa. And Farsi. And Russian, and Chinese, and Korean," Ensor said, "the languages of the countries that we're trying to reach, where it is our feeling people don't have enough access to honest information." 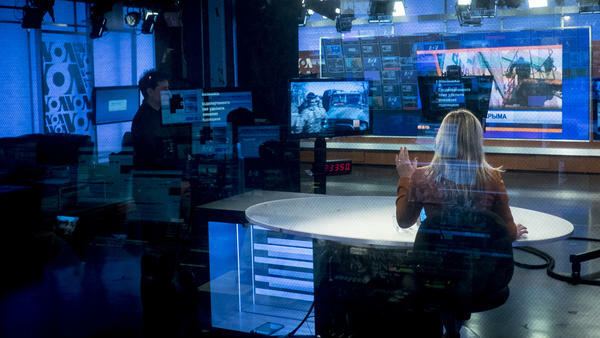 The VOA is actually the largest of a number of broadcasting networks already run by the United States, including Radio Free Europe, Radio Free Asia, Office of Cuba Broadcasting and Middle East Broadcasting Networks. They're overseen by the U.S. Agency for Global Media. USAGM CEO John F. Lansing said the networks are all independent from the government by law. "It's mandated by law that is written into the legislation that founded the Voice of America and our other entities, that there will be no interference in the editorial judgment of these networks," Lansing said. But concerns of political interference in the networks were raised after Trump nominated Michael Pack to replace Lansing, who was an Obama appointee. Pack was a former programming executive at the Corporation for Public Broadcasting and has produced documentaries with none other than Steve Bannon, the conservative news website executive and former Trump adviser and campaign CEO. The Senate has yet to take up Pack's nomination. James Glassman, a former chairman of the Broadcasting Board of Governors, USAGM's predecessor, thinks there is too much independence on the part of VOA. Glassman believes the network should be more integrated into U.S. foreign policy. For instance, he said, if the administration wants to discourage Iran from developing a nuclear weapon, VOA can play a role. "I think that VOA could, for example, have programming that tells the Iranian people that its government is wasting the vast, vast sums of money that could be used to improve the economy on a nuclear program," Glassman said. But, he added, "There is a great reluctance to take orders" at the network. Bennett, the VOA director, said the network is insulated by a firewall of laws and the independence of its journalists from political interference — and is driven by its news judgment. "If somebody says, 'Do this story, because I want to do it, because it advances my interests,' we'll see," she said, adding that VOA would act as any news organization would, asking, "Is this news or not? And if it's not, then it's, 'Thank you for your input.' "
President Trump often rails against U.S. news, media and specific reporters, even. Last week he tweeted, there should be, as he put it, quote, "a worldwide network to show the world the way we really are - great," exclamation point. Turns out there is such a worldwide network. It is run by the U.S. government, and it's called the Voice of America. But the broadcasts don't always paint America in a positive light. Here's NPR's Brian Naylor. BRIAN NAYLOR, BYLINE: The VOA was created during World War II by President Roosevelt to broadcast behind enemy lines what its current director, Amanda Bennett, says was the truthful news about the war as opposed to Nazi propaganda. She says, over the years, the mission hasn't really changed that much. AMANDA BENNETT: Our job is to do two things. One is to tell America's story objectively to places that can't see it otherwise. And the other one is to bring objective news and information to places that have no other access to it. So we say that in a large part of the world, we are the free press. NAYLOR: So she says it's critical VOA not spread propaganda but tell the truth about America, warts and all. BENNETT: Good stories, bad stories, hard issues, you know, fun issues. We're trying to give a complete picture so that people can see who we really are. NAYLOR: For instance, the top story on the VOA's website last week was about GM's decision to close several of its factories. NAYLOR: Former VOA director David Ensor, a one-time NPR correspondent, says he'd noticed that audience numbers jumped when VOA told some what he calls not so pleasant truths about the U.S., whether it was the protests in Ferguson, Mo., or the Abu Ghraib scandal. DAVID ENSOR: When foreigners hear an American broadcaster who's funded by the United States talking honestly about our problems as a country, it impresses them. It builds credibility for Voice of America, and that builds audience and impact. NAYLOR: Some 275 million people around the world listen to the VOA in 47 different languages, which Ensor says distinguishes it from networks such as CNN International. ENSOR: What Voice of America does is it broadcasts in Hausa and Farsi, and Russian and Chinese, and Korean, the languages of the countries that we're trying to reach where it is our feeling people don't have enough access to honest information. NAYLOR: VOA is overseen by the U.S. Agency for Global Media. CEO John Lansing says it's independent from the government by law. JOHN LANSING: The most important thing to understand about our independence from the federal government is that it's mandated by law, that it's written into the legislation that founded the Voice of America and our other entities, that there will be no interference in the editorial judgment of these networks. NAYLOR: But James Glassman, a predecessor of Lansing's, says VOA has what he calls an independence problem and should be better integrated into U.S. foreign policy. JAMES GLASSMAN: It has to abide by the basic rules of journalism of truth telling and transparency. But it needs to actually achieve things for U.S. foreign policy and national security, and that's really not the way it's structured now. NAYLOR: Trump's nomination of Michael Pack, who's produced documentaries with Steve Bannon, to lead USAGM has raised concerns about political interference by the administration in VOA's operations. But if that were to happen, Bennett says, she has an answer. BENNETT: Is this news or not? And if it's not then it's, thank you for your input. NAYLOR: Brian Naylor, NPR News, Washington. Transcript provided by NPR, Copyright NPR.